There are so many things happening on your wedding day that it can make the day seem like it passed by in a blur. With the amount of time that it took to plan your special day, it’s important that you have a keepsake to remember it. At John Creighton Photography in Parker, we take pride in providing couples with memories that they will cherish forever. Our team will work with you to capture the most beautiful and special moments of your big day so that you can look back at them for many years. If you are in search of a wedding photographer and you are interested in learning more about our wedding packages, browse our website and schedule an appointment with John Creighton Photography today! Your wedding photos are a great way to memorialize your big day, and many couples share those memories for many years. That being said, the last thing you want is to go into your big day expecting gorgeous wedding photos only to come away disappointed. In part one of this series, we discussed a few common mistakes that people make regarding their wedding photos. 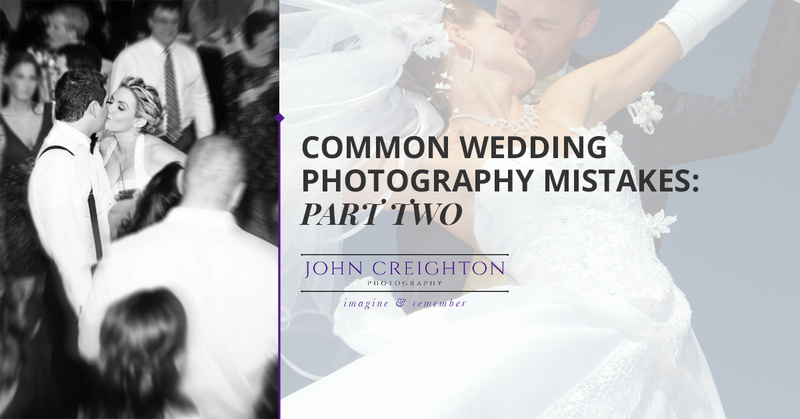 In today’s post, we will continue with a few more mistakes that you should avoid making if you want to enjoy your wedding photos for years into the future. If you have the money in your budget, you may want to consider hiring a second wedding photographer. With one photographer you will receive a collection of beautiful photos, but adding a second photographer will add unique angles to your photos. While one photographer is taking posed shots, another will be able to capture more candid photos, or even get more artistic. If your wedding photos are an important aspect of your big day, then getting a second photographer is a must. There’s no question that there is a lot going on on your wedding day. Between getting ready, the wedding ceremony, mingling with guests, and dancing at the reception, the day is sure to fly by. Not to mention, you have to make time to take photos either before or after the ceremony. Your wedding photos are an important aspect of your wedding, but they aren’t the only thing you have to worry about. Many couples make the mistake of spending too much time taking photos when they should be focused on their guests. The best way to combat this issue is to hire a photographer who knows how to balance time between taking posed photos and capturing candids while you socialize with guests. The “first look” is a classic shot where the photographer captures the moment the couple sees each other for the first time before they get married. This moment can take place at the ceremony, but if you’re trying to get as many photos as possible, it might be in your best interest to capture this moment before the ceremony begins. Having your photographer capture some of the couple photos before the ceremony instead of after can help you save time while also allowing you to take more photos. One of the most trivial mistakes that you can make is not hiring your wedding photographer far enough in advance. If you’re planning on getting married in the near future in Parker or the surrounding areas, then you need the team at John Creighton Photography. Browse our website to view some of our wedding photos or read reviews and give us a call to schedule an appointment today!